Most philosophers and political scientists readily admit that Thomas Hobbes is a significant figure in the history of political thought. His theory was, arguably, one of the first to provide a justification for political legitimacy from the perspective of each individual subject. Many excellent books and articles have examined the justification and structure of Hobbes’ commonwealth, ethical system, and interpretation of Christianity. 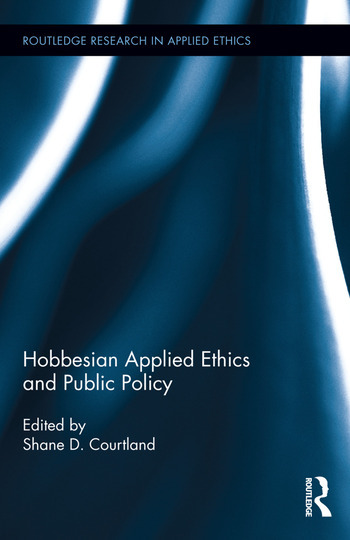 What is troubling is that the Hobbesian project has been largely missing in the applied ethics and public policy literature. We often find applications of Kantian deontology, Bentham’s or Mill’s utilitarianism, Rawls’s contractualism, the ethics of care, and various iterations of virtue ethics. Hobbesian accounts are routinely ignored and often derided. This is unfortunate because Hobbes’s project offers a unique perspective. To ignore it, when such a perspective would be fruitful to apply to another set of theoretical questions, is a problem in need of a remedy. This volume seeks to eliminate (or, at the very least, partially fill) this gap in the literature. Not only will this volume appeal to those that are generally familiar with Hobbesian scholarship, it will also appeal to a variety of readers that are largely unfamiliar with Hobbes. Applied Ethics: A Challenge to Contractarianism? Shane D. Courtland currently works at West Virginia University. His publications have appeared in Pacific Philosophical Quarterly, Journal of Environmental Philosophy, Journal of Applied Philosophy, Journal of Mind and Behavior, Southwest Philosophy Review, Hobbes Studies, Reason Papers, Utilitas, Stanford Encyclopedia of Philosophy and Routledge’s Ethics in Politics.